Archeologists have established that in the western part of Panama, people have lived for about 2,400 years. 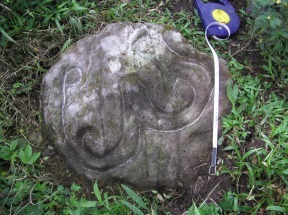 Many people I am sure are familiar with the great archeological treasures of Sitio Barriles in Chiriqui. 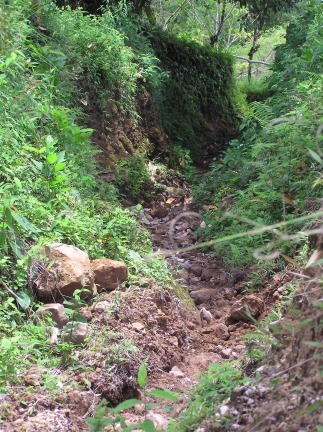 I am also sure that few individuals are aware of the existence of Panama’s oldest highway – the Gariche trail. It was a warm sunny day in October when I ventured on, what was to be a long exhausting journey along this ancient thoroughfare. My Guide was José Luis Landau, owner of Sitio Barriles. He had told me that in 2001, a group of German Archeologists, from Berlin’s, Free University, theorized there was a trail running all the way from Puerto Armuelles on the coast, direct to Sitio Barriles, 6 kilometers west of Volcan. The total distance of the trail is more than 40 miles. 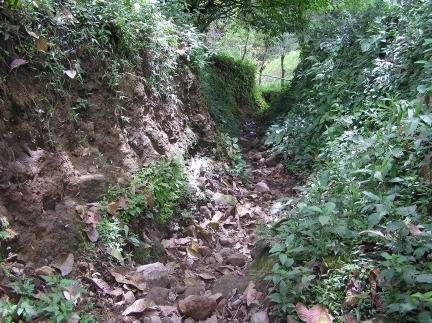 For most of its length the trail is a narrow gorge about 15 feet deep and about 4 to 6 feet wide. It is easy to believe that this trail was not carved out in the accepted sense, but was worn down to its present height by thousands of ancient travelers. The trail has just enough room for a horse or a single file of people. The composition of the base of the trail is small rough rocks - very rough rocks. At times even the horses were having difficulty maneuvering around the tight twisting curves of this ancient highway. After an hour and a half of tough hiking we reached the one-piece of evidence that gives this trail its authenticity. The Gariche Petroglyph. I was disappointed to find, not a multiton megalith, but a small stone barely 2 feet across. But this stone, insignificant as it might first appear has some startling similarities to the larger stones at Sitio Barriles. It links several spirals that experts believe represent small towns or villages along the route. There is another, larger petroglyph close by. This stone is devoid of the usual markings but does appear to show numerous local springs and water sources. Chiriqui is rich in ancient artifacts. This might well have been the main landing place of the Ainu seafarers about 2,400 years ago. They brought a rich and sophisticated culture to the American continent. One just has to see the ornate and exquisite jewelry on display at the national museum to realize that these ancients were culturally far advanced. The questions about the Gariche trail are many. Why did they travel so far north to Barriles? Why not live on the coast? How many years did they travel back and forth along this ancient rocky road? The most intriguing question of all is, did the eruption of the Baru Volcano in 600 A.D. cause their sudden disappearance? The Gariche Trail remains in constant use, 2,400 years after it was first carved out. 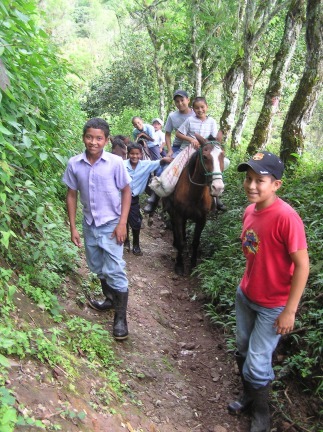 Farmers, schoolchildren and the people of the area walk its long, rough pathway every day. 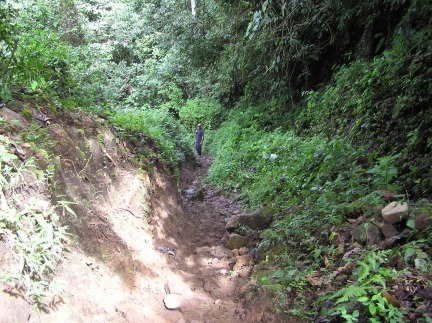 Modern development has obscured most of the trail but visitors can hike this ancient “road less traveled.” In Volcan, turn left at the Agro-Chemico store and head west to the El Valle school. Then you have two kilometers of unpaved road before you reach a fork. Turn left and after 8 further kilometers you reach the small community of Gariche. Locals will direct you and might even, for a small fee, guide you along the trail. Bring sturdy boots and lots of water. The road to Gariche does require a sturdy 4x4 vehicle.